The Niagara Escarpment is a large limestone ridge, starting in upstate New York and continuing west through Canada and then into the Upper Midwest. The entire ridge was declared as a UNESCO World Biosphere Reserve in the 1990s. 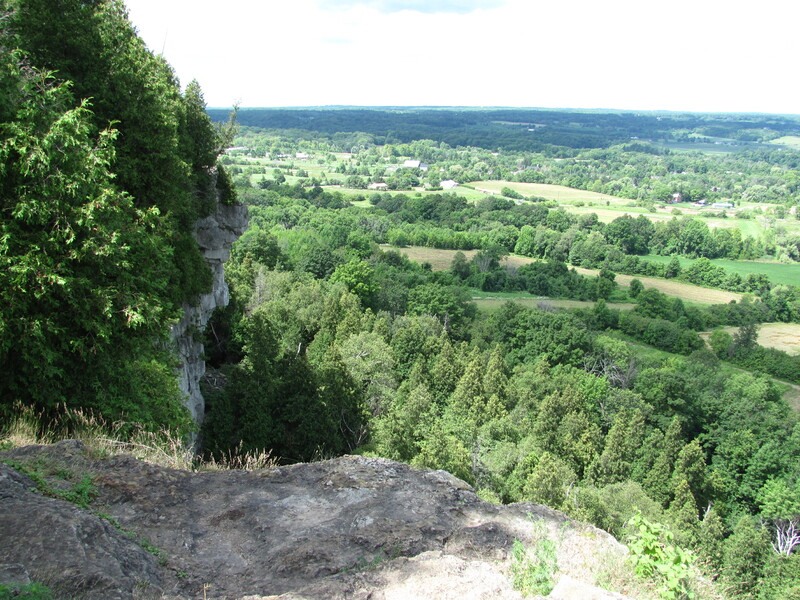 Mount Nemo is a conservation area with three hiking trails, one of which is a section of the Bruce Trail: a long-distance hiking trail running down the province from Lake Huron to the Niagara Peninsula. The Escarpment almost seems like the backbone of a giant extinct animal poking up out of the earth. And walking along the ridge and through Mount Nemo, you do feel like you’ve been transported back in time to an ancient forest. There are lots of cedars – some of the oldest in North America, according to the area guides – and red oaks, and ferns. About the Bruce Trail: it starts in Tobermory, on the Bruce Peninsula at Lake Huron, and continues southeast until it reaches Queenston, near St. Catharine’s, the Niagara River and the U.S. border. 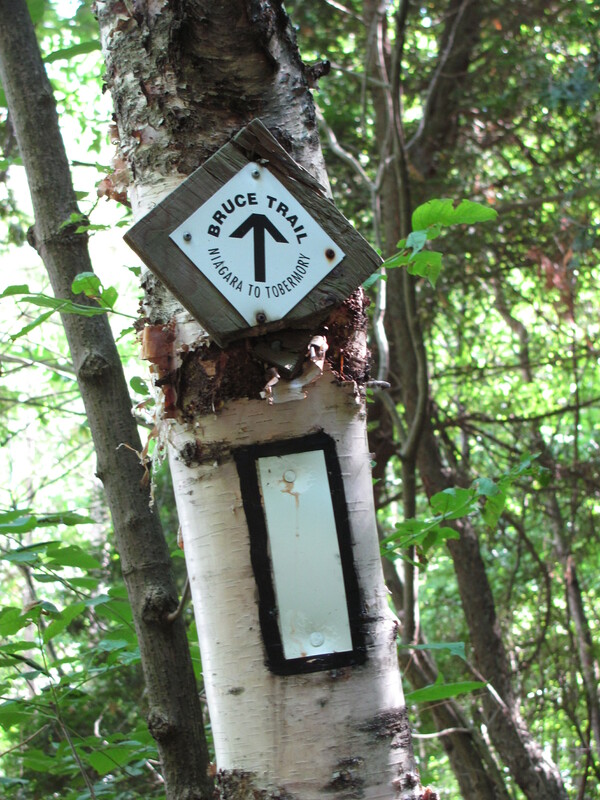 The trail itself is about 890 km (553 miles), according to the Bruce Trail Conservancy. The side trails add on another 400 km (248 miles). So it’s a bit of a trek. Each section of the trail has a local group of volunteers that oversee and maintain it; the section that includes Mount Nemo is managed by the Iroquoia Club, which oversees the trail from Grimsby to Milton. Blazes for the Bruce Trail. Like the Appalachian Trail, the Bruce Trail has its own coterie of hikers (die-hard and otherwise) who have made it their goal to thru-hike the whole trail, whether all at once (a trek that takes about 30 days, according to one source), or in sections. In addition to hikers, the Escarpment is a popular destination with rock climbers and cliff hangers. Certain areas, it should be noted, are subject to certain climbing restrictions; the Alpine Club of Canada (they seem to know a few things about dangling off of cliff faces) has some good notices on its website. There are also some caves in the area. When we were there, however, there were notices up advising people to stay out of the caves, due to an outbreak of White Nose Syndrome that was sickening a lot of bats. The restrictions may still be in check – please check with the Bruce Trail Conservancy or the Ministry of Natural Resources if you’re planning a visit. Mount Nemo is near Lowville and Burlington, about 45 minutes to an hour west of Toronto, depending on traffic. To get there from the city, as I recall, we took ON-401, 403 and 407 (toll road) to get to Guelph Line in Burlington, and headed north from there. The park entrance and trailhead are on Colling Road, near the intersection with Guelph Line. There is a parking area at the trailhead – free of charge for Bruce Trail members, fee required for everyone else. Part of the ways into the woods, along the main trail leading to the loop trails’ junction, there is a tin-roof outhouse (unisex) for those who need to use the facilities. There are two loop trails: the orange-blazed North Loop and the yellow-blazed South Loop. The trails, in total, add up to about 4.6 km (that’s a little bit over two miles). The Bruce Trail enters the Mount Nemo boundaries at the southern tip and follows the edge of the Escarpment, running parallel with the two loop trails along the cliff edge before heading out along Colling Road. The South Loop will take you to a scenic overlook with a monument and plaque to Joseph Walter Brock Harris, who was a member of the Halton Region Conservation Authority – the group that helped declare Mount Nemo as a protected area. The trail also takes you past an old quarry and some concrete ruins. The North Loop will take you past a couple of overlooks – no railings whatsoever – so you can step out to the edge and gaze out over all the farmland and pastures across the countryside. There’s something about being able to step almost to the edge of a cliff and gaze out over the landscape far below. It’s almost as if you’re floating. In terms of difficulty, the hike is about moderate. There are some rocks and some slopes that need climbing over. The loop hikes are fairly short, in terms of mileage, but they’re best tackled by hikers in relatively good shape. The guide sign at the park entrance advises you that the loop hikes take about an hour each to complete. So if you do both loops, that’s a hike that’ll take up a good chunk of the morning. Don’t forget to drink plenty of water, of course – by the end of the hike, we were all a little tired and volume-depleted, and ready for some lunch. I’d definitely want to go again, spend a little more time checking out some of the rock formations and some of the local wildlife and trees, and maybe try to find some of the caves. And a thru-hike of the Bruce Trail? I think that’s another hike to add to the bucket list.